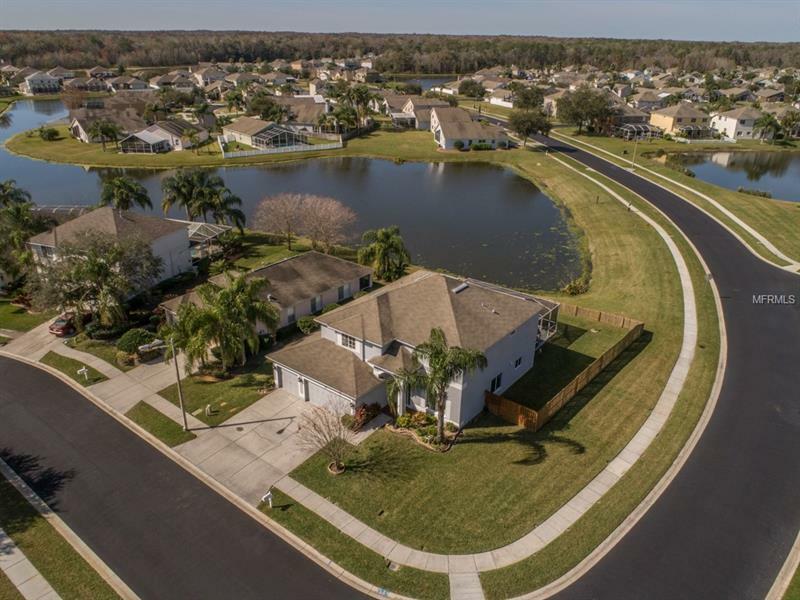 This gorgeous east-facing 5 bedroom, 3 bath, 3-car garage two-story pool home including jetted spa with heater is situated on a fenced, premium over-sized corner lot on a pond. Entering the home you are welcomed by a grand two-story foyer featuring an upgraded wood-spindle staircase. The downstairs floor plan includes a large formal living room & dining room with crown molding & elegant accent work. An open kitchen with recessed lighting, tile floor, upgraded cabinets, granite counter tops, two pantries, breakfast nook with bay window, a chef's island with two outlets for culinary appliances, stainless steel appliances including a new microwave, dishwasher and disposal, breakfast bar that is open to a large great room that boasts a French oak hardwood floor, recessed lighting & built-in surround sound. The kitchen & family room both overlook the pool & heated spa has with new motor, and a fountain with spill-over wall, & colored lighting. The downstairs has a guest bedroom and a full bathroom. Upstairs, there are 4 generously-sized bedrooms, one of which has been remodeled into a study with floor-to-ceiling shelving and French doors; a second full bathroom, a hallway laundry room with a wash tub. The master suite features crown molding, surround sound, 2 closets, a spacious bathroom with upgraded sinks, cabinets & granite counter tops. Exterior and interior recently painted, new coach lights, a new A/C unit with UV light installed to eliminate allergens & bacteria, new garage door opening hardware.